Assistant Banquet Managers assist the Banquet managers with all details of banquets like decorations, cleanliness, service management, layouts and supervising. 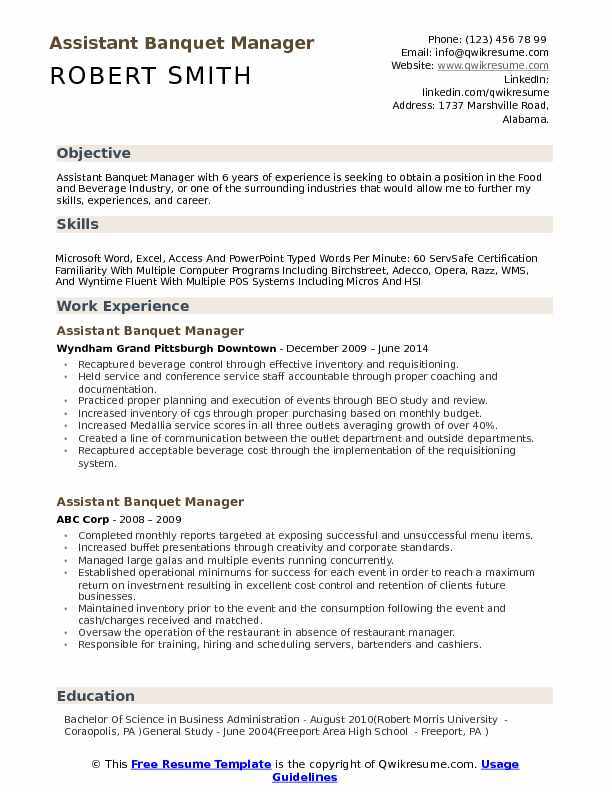 Assistant Banquet manager resume sample is tasked with various job duties such as assigning tasks to kitchen staff and service workers, ensuring that the kitchen and the conference area is well organized and clean, decorating the event place, purchasing equipment, making note of supplies and purchases and ordering food ingredients. These assistants to Banquet managers need to take charge of certain administrative functions and prepare the staff work schedule also. 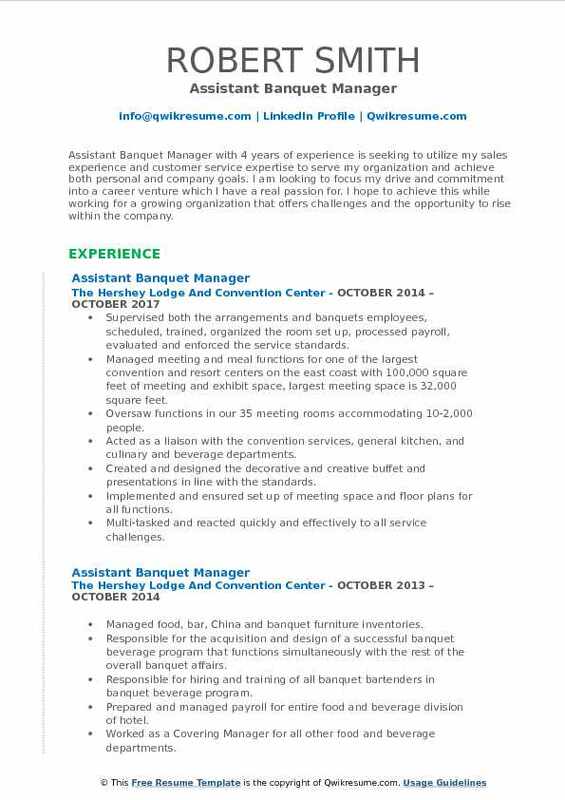 Some key attributes to become an Assistant Banquet Manager is to possess excellent skills in problem-solving, critical thinking, organizational and communication. Even though many supervisors have reached to become an Assistant Banquet manager with previous experience in the food industry, hiring employer prefers a Bachelors or associate or graduate degree in hospitality management or its related field. 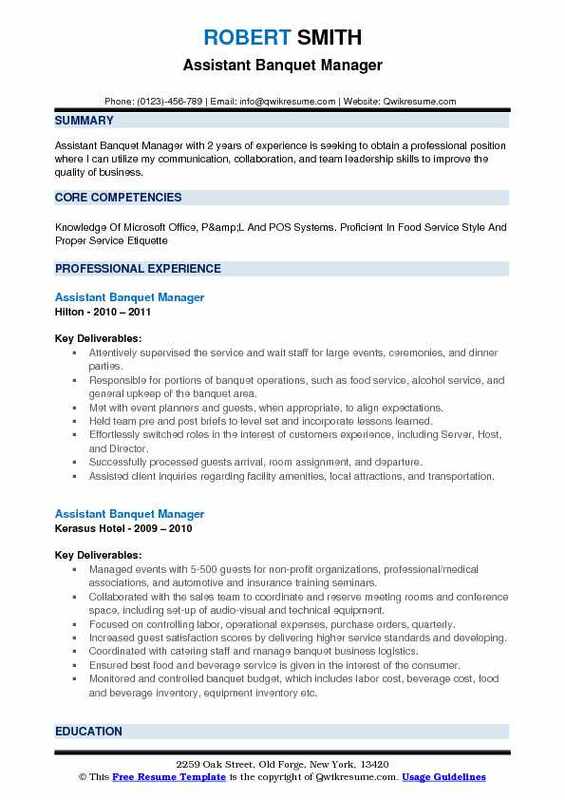 Headline : Assistant Banquet Manager with 6 years of experience is seeking to obtain a position in the Food and Beverage Industry, or one of the surrounding industries that would allow me to further my skills, experiences, and career. Recaptured beverage control through effective inventory and requisitioning. Held service and conference service staff accountable through proper coaching and documentation. Practiced proper planning and execution of events through BEO study and review. Increased inventory of cgs through proper purchasing based on monthly budget. Increased Medallia service scores in all three outlets averaging growth of over 40%. Created a line of communication between the outlet department and outside departments. Recaptured acceptable beverage cost through the implementation of the requisitioning system. Recreated room service gratuity system to comply with changes to union CA. Established meal specials and beverage specials to capture transient guests attending local events. Handled service and food quality issues through honest and proactive practices. 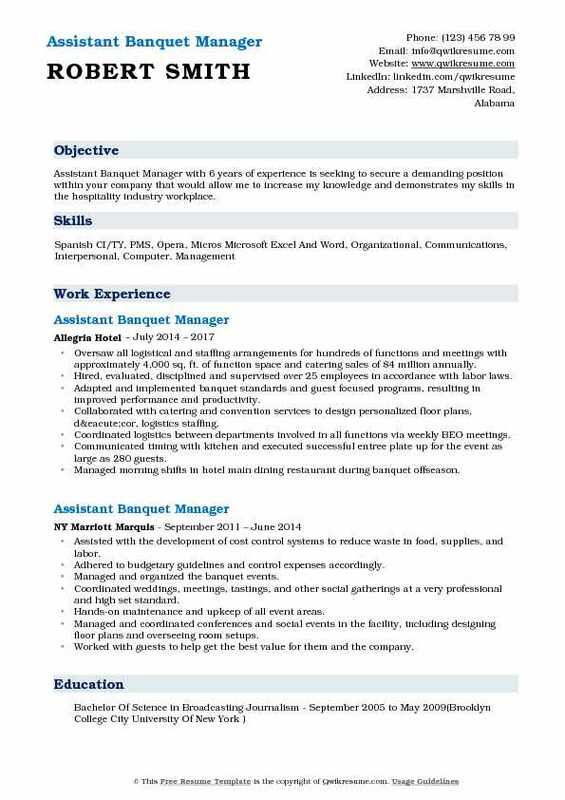 Objective : Assistant Banquet Manager with 2 years of experience is seeking to obtain a professional position where I can utilize my communication, collaboration, and team leadership skills to improve the quality of business. Attentively supervised the service and wait staff for large events, ceremonies, and dinner parties. Responsible for portions of banquet operations, such as food service, alcohol service, and general upkeep of the banquet area. Met with event planners and guests, when appropriate, to align expectations. Held team pre and post briefs to level set and incorporate lessons learned. Effortlessly switched roles in the interest of customers experience, including Server, Host, and Director. Successfully processed guests arrival, room assignment, and departure. Assisted client inquiries regarding facility amenities, local attractions, and transportation. Memorably greeted guests at check in with name recognition for repeat guests. Managed disputes with professionalism and "win-win" outcomes on several occasions. Coordinated international and domestic logistics for 13 French citizens and 16 Brazilian citizens. 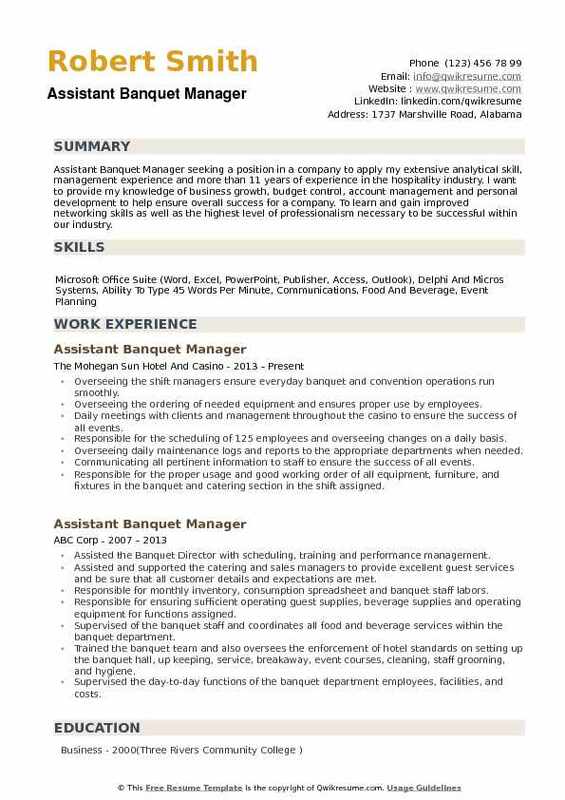 Summary : Assistant Banquet Manager with 10 plus years of experience is seeking to continue my career with an organization that will utilize my management, supervision and communication skills to benefit mutual growth and success. Possessing excellent planning, organizational and time management skills. Demonstrating the ability to communicate in a professional manner, both in oral and written. Handling the tasks of monitoring and supervising the setting-up, maintenance, and break-down of banquets. Ensuring compliance with health, sanitation, safety, and alcohol awareness standards. Responsible for providing high standards of food and beverage product and services. Generating and implementing the effective marketing strategies to maximize profits and ensure outstanding customer service. Handling the tasks of interviewing, training, supervising, counseling, scheduling and evaluating the performance of banquet staff. Briefing all employees as a team leader. Checking all function rooms to ensure they are ready, with all equipment in good working order. 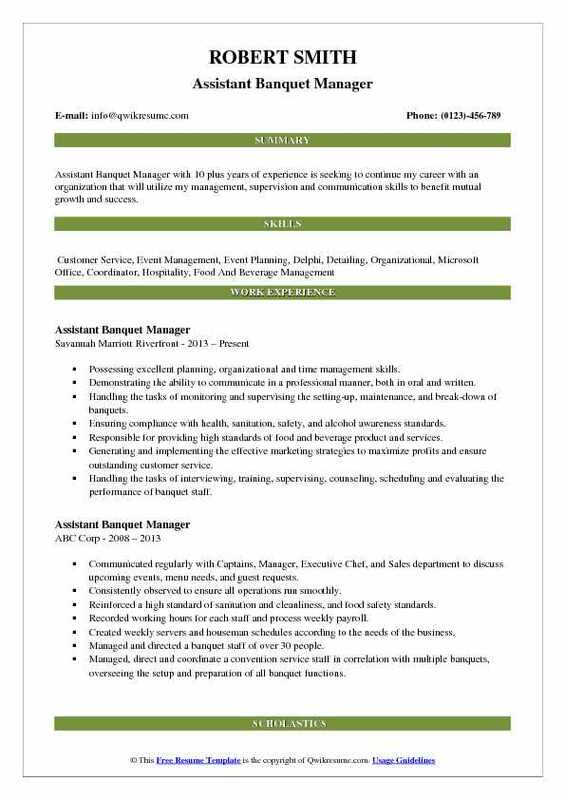 Objective : Assistant Banquet Manager with 4 years of experience is seeking to utilize my sales experience and customer service expertise to serve my organization and achieve both personal and company goals. I am looking to focus my drive and commitment into a career venture which I have a real passion for. I hope to achieve this while working for a growing organization that offers challenges and the opportunity to rise within the company. Supervised both the arrangements and banquets employees, scheduled, trained, organized the room set up, processed payroll, evaluated and enforced the service standards. Managed meeting and meal functions for one of the largest convention and resort centers on the east coast with 100,000 square feet of meeting and exhibit space, largest meeting space is 32,000 square feet. Oversaw functions in our 35 meeting rooms accommodating 10-2,000 people. Acted as a liaison with the convention services, general kitchen, and culinary and beverage departments. Created and designed the decorative and creative buffet and presentations in line with the standards. Implemented and ensured set up of meeting space and floor plans for all functions. Multi-tasked and reacted quickly and effectively to all service challenges. Summary : Assistant Banquet Manager III with 22 plus years of experience is seeking to secure a position in the banquet/catering field which will enable me to use my strong attention to detail and high regard for excellent customer service. Managing the technical aspects of all events ranging from 4-person board meetings to banquets of 1000 guests. Directing conference set-up houseman, banquet service staff and coordinating with culinary departments and stewarding departments to run seamless, successful and memorable events. Administering hotel and departmental rules, regulations, policies and procedures, and ensuring consistent application and enforcement in banquets and conference set-up department. Hiring, training, cross-training, disciplined, evaluating and motivating all levels of permanent and on-call staff. Managing the work schedule for banquet servers, captains and conference set-up supervisors, and houseman. Forecasting and monitoring inventory to ensuring adequate supplies for events. Overseeing general housekeeping, maintenance, and appearance of 70,000 sq.Ft. of indoor/outdoor meeting/banquet areas. 34 meeting rooms which include two 12,000 sq. Ft. Grand ballrooms. Improved overall productivity and reduced labor cost by diligently monitoring labor and operating within budget for a $12 million annual revenue division. Initiated and implemented safe practices to improve the environment and reduced the incidence of injury. 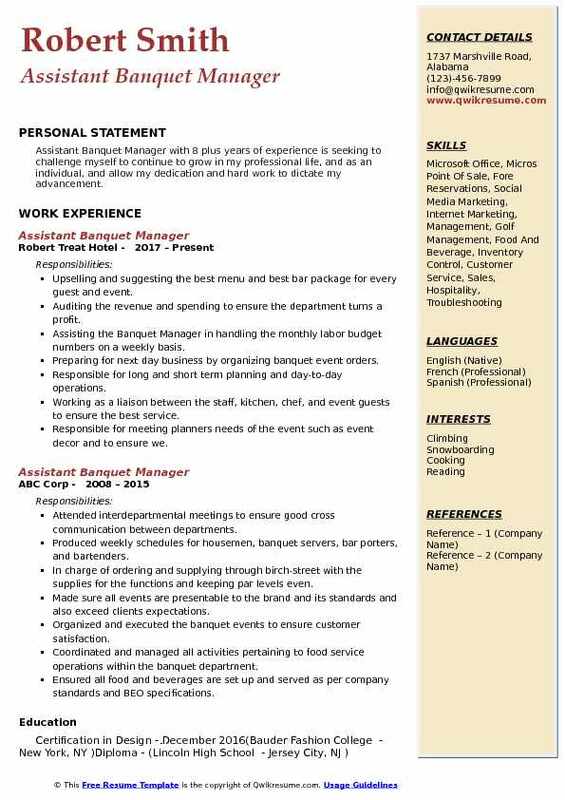 Headline : Assistant Banquet Manager with 6 years of experience is seeking to secure a demanding position within your company that would allow me to increase my knowledge and demonstrates my skills in the hospitality industry workplace. Oversaw all logistical and staffing arrangements for hundreds of functions and meetings with approximately 4,000 sq, ft. of function space and catering sales of $4 million annually. Hired, evaluated, disciplined and supervised over 25 employees in accordance with labor laws. Adapted and implemented banquet standards and guest focused programs, resulting in improved performance and productivity. Collaborated with catering and convention services to design personalized floor plans, décor, logistics staffing. Coordinated logistics between departments involved in all functions via weekly BEO meetings. Communicated timing with kitchen and executed successful entree plate up for the event as large as 280 guests. Managed morning shifts in hotel main dining restaurant during banquet offseason. Provided prompt, courteous, friendly and professional service to all banquet guests and banquet employees at all times. 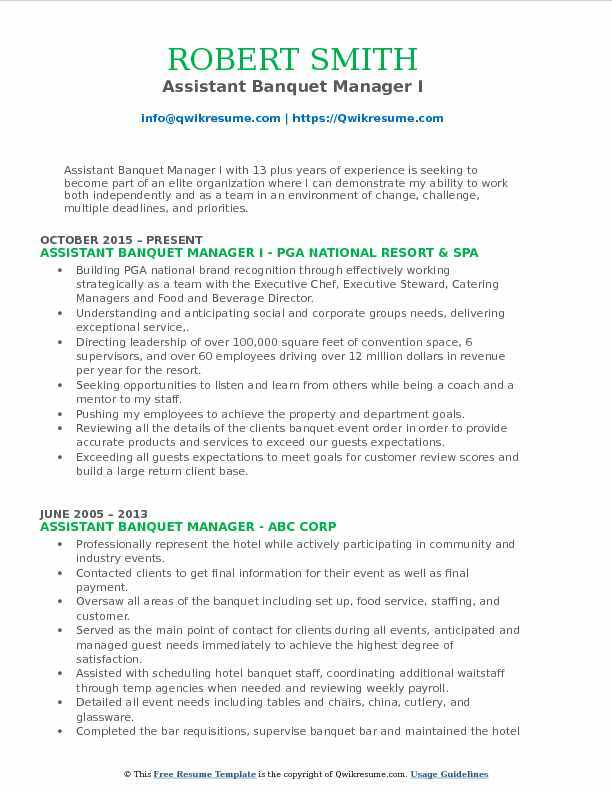 Summary : Assistant Banquet Manager I with 13 plus years of experience is seeking to become part of an elite organization where I can demonstrate my ability to work both independently and as a team in an environment of change, challenge, multiple deadlines, and priorities. Building PGA national brand recognition through effectively working strategically as a team with the Executive Chef, Executive Steward, Catering Managers and Food and Beverage Director. Understanding and anticipating social and corporate groups needs, delivering exceptional service,. Directing leadership of over 100,000 square feet of convention space, 6 supervisors, and over 60 employees driving over 12 million dollars in revenue per year for the resort. Seeking opportunities to listen and learn from others while being a coach and a mentor to my staff. Pushing my employees to achieve the property and department goals. Reviewing all the details of the client's banquet event order in order to provide accurate products and services to exceed our guests' expectations. Exceeding all guests expectations to meet goals for customer review scores and build a large return client base. Communicating effectively with clients, guests, and other departments to ensure that all events run smoothly and all event needs are delivered. Summary : Assistant Banquet Manager with 7 years of experience is looking to succeed in a challenging environment while contributing to the growth and success of the company. 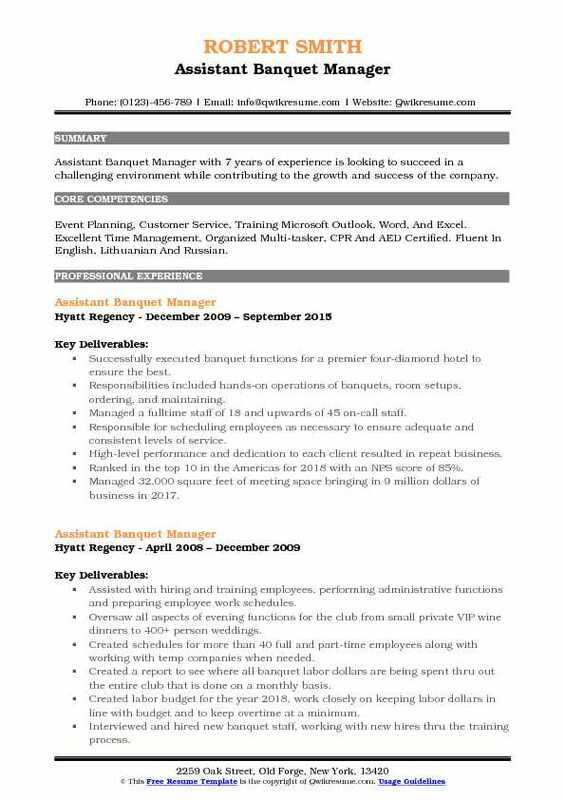 Skills : Event Planning, Customer Service, Training Microsoft Outlook, Word, And Excel. Excellent Time Management, Organized Multi-tasker, CPR And AED Certified. Fluent In English, Lithuanian And Russian. Successfully executed banquet functions for a premier four-diamond hotel to ensure the best. Responsibilities included hands-on operations of banquets, room setups, ordering, and maintaining. Managed a fulltime staff of 18 and upwards of 45 on-call staff. Responsible for scheduling employees as necessary to ensure adequate and consistent levels of service. High-level performance and dedication to each client resulted in repeat business. Ranked in the top 10 in the Americas for 2018 with an NPS score of 85%. Managed 32,000 square feet of meeting space bringing in 9 million dollars of business in 2017. Assisted with the implementation and training of a new pos system used by banquets and outlets. Managed and coordinated the conferences and social events in the facility, including designing floor plans and overseeing room setups. Suggested and developed the best package for guests specific event needs. 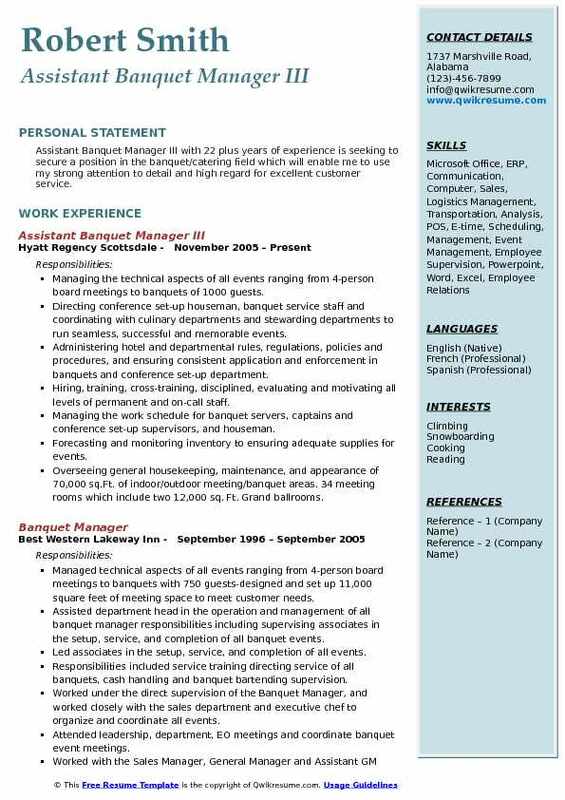 Summary : Assistant Banquet Manager with 8 plus years of experience is seeking to challenge myself to continue to grow in my professional life, and as an individual, and allow my dedication and hard work to dictate my advancement. Upselling and suggesting the best menu and best bar package for every guest and event. Auditing the revenue and spending to ensure the department turns a profit. Assisting the Banquet Manager in handling the monthly labor budget numbers on a weekly basis. Preparing for next day business by organizing banquet event orders. Responsible for long and short term planning and day-to-day operations. Working as a liaison between the staff, kitchen, chef, and event guests to ensure the best service. Responsible for meeting planners needs of the event such as event decor and to ensure we. Oversaw the daily operation of the banquet facility. Scheduling banquet servers and Housman. Reviewing banquet event orders and make sure all banquet space was set correctly in accordance with banquet event orders. Checking with clients to make sure they were happy with all aspects of the meeting. Performing the monthly inventory of all banquet equipment. Oversaw banquet payroll for the department. Summary : Assistant Banquet Manager seeking a position in a company to apply my extensive analytical skill, management experience and more than 11 years of experience in the hospitality industry. I want to provide my knowledge of business growth, budget control, account management and personal development to help ensure overall success for a company. To learn and gain improved networking skills as well as the highest level of professionalism necessary to be successful within our industry. Overseeing the shift managers ensure everyday banquet and convention operations run smoothly. Overseeing the ordering of needed equipment and ensures proper use by employees. Daily meetings with clients and management throughout the casino to ensure the success of all events. Responsible for the scheduling of 125 employees and overseeing changes on a daily basis. Overseeing daily maintenance logs and reports to the appropriate departments when needed. Communicating all pertinent information to staff to ensure the success of all events. Responsible for the proper usage and good working order of all equipment, furniture, and fixtures in the banquet and catering section in the shift assigned. Providing the unique and creative ideas to enhance meetings group experience.